Branching and merging is one of the most nerve-racking activities for people working with Subversion. Unlike Mercurial and other DVCS where branching and merging is commonplace, typical workflows in Subversion do not include this activity. As a result, the terminology is typically confusing, the massive number of changes can be scary, and a lot of people are so concerned about "getting it right" that they typically just avoid the practice altogether and work completely outside of source control. That, of course, is the exact opposite of what we need when working on an important design spike or critical new feature. For these instructions, I assume that you have a subversion repository checked out and you're actively working on the trunk. Right-click on the directory you want to branch. Pick the Branch/Tag operation. On the branch/tag screen, enter a new branch (typically the repository has a /branches folder as well as a /trunk folder). The new branch is typically /branches/mynewbranch, where the branch name itself is a folder that does not exist in the repository. 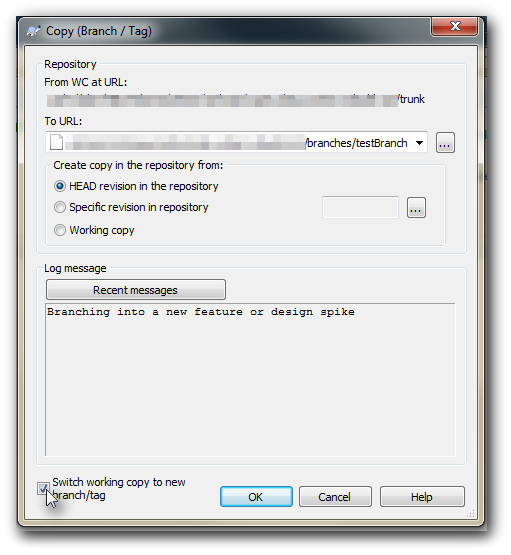 In this scenario, you will also want to choose "switch working copy to new branch/tag". We'll be doing work on the new feature or design change immediately, so this tells subversion that any new commits will be on that other branch. At this point you'll want to take note of the revision number that had the last changes. This is standard subversion behavior. You'll want to keep track of the last revision you've pulled changes from. In the beginning, this revision number is the revision that represented the branch itself. Pick the Merge tool off the TortoiseSVN menu. Choose the "Merge a range of revisions" from the first screen of the wizard. 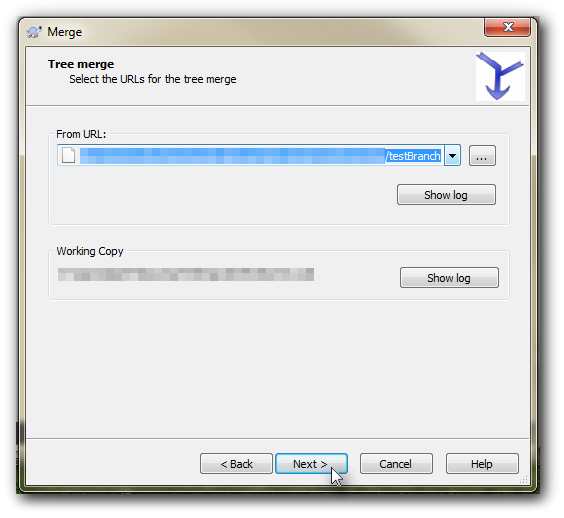 In the "URL to merge from", choose the trunk. In the Revision range to merge, the best approach is to be precise. Put in the last revision number that was merged (e.g. if you branched when the repository was at revision 10, put in 11-HEAD). You can leave this blank, but we want to avoid merging a change twice. You may need to look at the log to help find the right revisions. Hit next and do a test merge just to be sure before performing the actual merge. All other settings can be left at their defaults. Note that the merge is done in your working directory, so you'll have a bunch of local changes to test and commit on your branch. Switch the working directory back to the trunk. This is done via the TortoiseSVN switch command. Pick the Merge command off the TortoiseSVN menu as before. 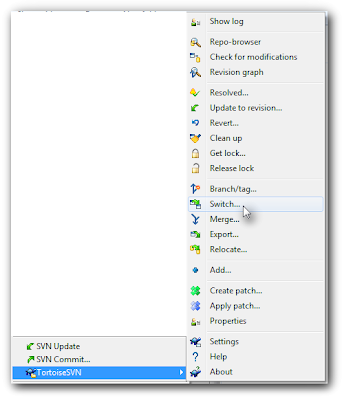 This time, however, we'll pick the "Reintegrate a branch" option. In the "From URL" field, put the URL to the branch you've finished working on. Test the merge and if happy, perform the merge, test the changes, and commit to the trunk. This entry was posted on 8:51 AM You can follow any responses to this entry through the RSS 2.0 feed. You can leave a response, or trackback from your own site. Thank you very much for this. Most clear description I have read on the topic.